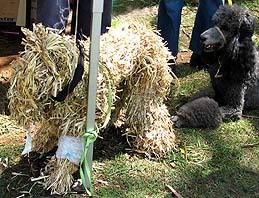 This was Spot, the Swagman's dog in the Strawy Matilda scarecrow display. And here is a solid straw puppy with his live poodle pal. 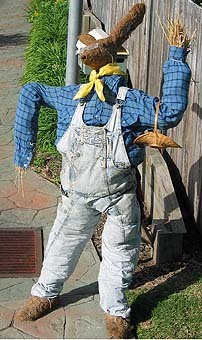 If you have a co-operative pet animal in your family, why not let her join in the fun by wearing a scarecrow hat? 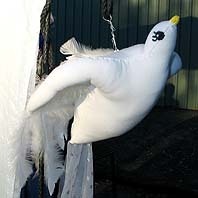 This wedding dove, from the Bicycle Built for Two scarecrow display, was made out of stretchy white fabric stuffed with cushion filling. A long tail of glittery gauze trailed behind her. She was suspended on the end of a stock whip and could be flown realistically through the air by swinging the whip around. 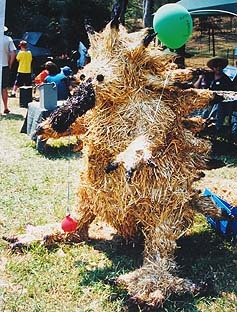 This creative echidna (or spiny ant eater) was solidly filled with straw. 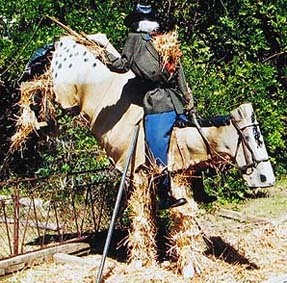 This jumping horse, from the Man From Strawy River scarecrow display, was made from a wooden frame with hessian nailed over it. 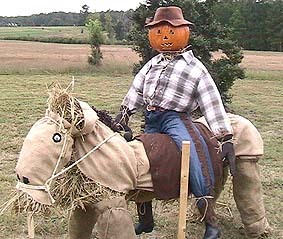 This terrific horse and rider scarecrow was created by Steve and Kay Miller in North Carolina. And here is the squatters magnificent thoroughbred stallion from the Strawy Matilda scarecrow display. 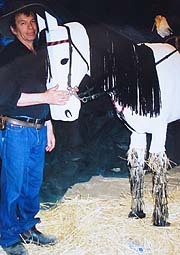 This horse had a wooden frame, a covering of fluffy flannelette and a black wool mane. The outline shape of a lizard was cut from a 2 cm thick piece of wood that was then painted to match the colouring of the lizard. 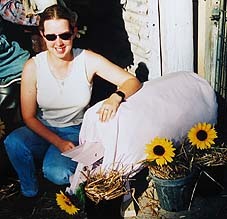 This pig scarecrow, from the Old MacStrawy Had a Farm display, was made by covering a wooden frame with pink cloth and stuffing it. Here is a rabbit jauntily dressed up and wearing a pair of spectacles. 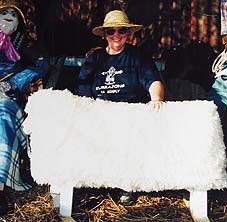 This sheep scarecrow, from the Old MacStrawy Had a Farm display, was made by covering a wooden frame with a shaggy white acrylic mat. 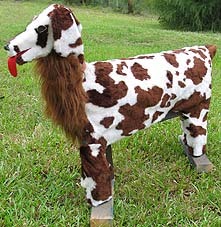 Note: This page includes animal scarecrow ideas for you and your kids to make so that you can include animals or pets in your scarecrow displays: dog scare crows, a bird scarecrow, a spiny anteater scarecrow, horse scarecrows, a lizard scarcrow, a pig scarecrow, a rabbit scarecrow and a sheep scarecrow.